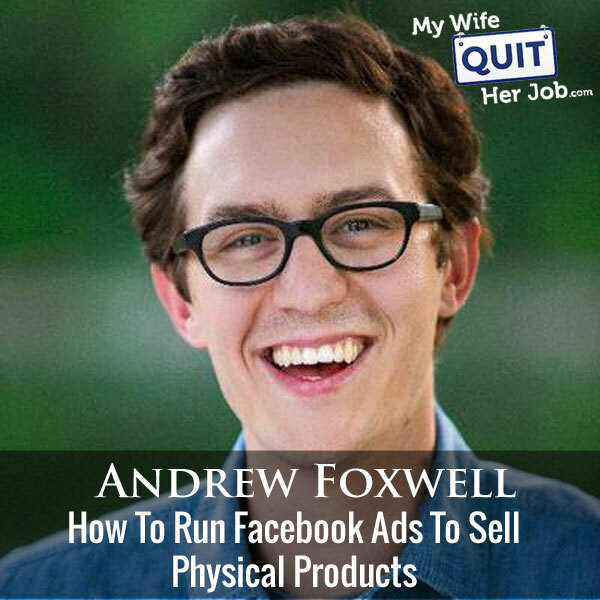 Andrew is also the cohost of the Ecommerce Influence podcast of which I was a guest on long ago and he and his wife Gracie have helped over 250 businesses manage over 10 million in Facebook ad spend. In short, Andrew is a Facebook and Instagram ads expert and we’re going to pick his brain today. You’re listening to the My Wife Quit Her Job Podcast, the place where I bring on successful bootstrapped business owners and delve deeply into what strategies are working and what strategies are not in business. And today I have Andrew Foxwell with me on the show. Andrew is the founder of Foxwell Digital, and he’s also the co host of the Ecommerce Influence Podcast. And Andrew is an expert on Facebook and Instagram ads specifically for selling physical products online. And in my opinion, this is one of the better Facebook episodes that I’ve heard. Klaviyo can track every single customer who has shopped in your store and exactly what they bought. So let’s say I want to send out an email to everyone who purchased a red handkerchief in the last week, easy. Let’s say I want to set up a special auto-responder sequence to my customers depending on what they purchased, piece of cake, and there is full revenue tracking on every single email sent. I also want to give a shout out to Privy who is also a sponsor of the show. Privy is the tool that I use to build my email list for both my blog and my online store. Now there are a bunch of companies out there that will manage your email capture forms, but I like Privy because they specialize in e-commerce. Right now I’m using Privy to display a cool wheel of fortune pop-up. Basically a user gives their email for a chance to win valuable prices in our store and customers love the gamification aspect of this. And when I implemented this form email signups increased by 131%. Bottom line, Privy allows me to turn visitors into email subscribers, which I then feed to my email provider to close the sale. So head on over to Privy.com/Steve and try it for free. And if you decide you need some of the more advanced features, use coupon code MWQHJ for 15% off. Once again, that’s P-R-I-V-Y.com/Steve. Now onto the show. Steve: Welcome to the My Wife Quit her Job Podcast. Today I’m happy to have Andrew Foxwell on the show. Now Andrew is someone I met through Austin Brawner, who I had back in Episode 165 and both of them run brand growth experts, which is a company that runs live workshops to help grow your business. Andrew is also the co host of the Ecommerce Influence Podcast of which I was a guest on long ago. And he and his wife Gracie have helped over 250 businesses manage over 10 million in Facebook ad spend. In short, Andrew is a Facebook and Instagram ads expert and we’re going to pick his brain today. And with that, welcome to show Andrew, how you doing today man? Andrew: I’m doing good. Thanks. Thanks. I’m glad to be here and glad to be chatting with all of you. It’s an honor to be on the podcast. So I’m doing well. Steve: It is an honor to have you. And for the benefit of the listeners, who don’t know who you are, give us a quick background story. Tell us how you got started with Facebook ads. Andrew: Absolutely. Yeah, I got started with Facebook ads. Actually, I’ve been doing it since it was invented. So I’ve been doing it since 2008. I was working for a member of Congress and was helping do social media. Facebook pages were invented in January of 2009. And from there I helped members of Congress launch Facebook ads and Facebook pages and helped them to get on social media. And then I went to 3Q Digital and became the director of social there doing mostly direct response Ecom buying. I had a team of seven that I worked with at 3Q, and I went out on my own with my wife after that. So Gracie and I’ve been running Foxwell Digital now for a little over four years. And we help e-commerce business owners and people running Facebook advertising to grow their businesses and to do it the right way. So we talk about ourselves as social media advisors is a big part of what we do. Steve: So you specialize in e-commerce stores selling physical products, right? Steve: That’s great because most of the Facebook consultants I find out there, they mainly focus on digital products. So it’s a great challenge to talk to someone who focuses on e-commerce. Andrew: Yeah, and I think a lot of those people that are in that industry, that are in that niche part of the industry, it is a similar, but separate discipline, right? So there are pieces to it where you’re using lookalike audiences, you’re using those tenets of what a good Facebook campaign looks like. But there are strategies and there are sort of margin conversations that you have to have that are a lot different for direct response product selling on Facebook. Steve: Oh, yeah, totally. I mean, I sell digital products. And I can be kind of Lucy goosey with my budget on Facebook, because my product is 1,500 bucks and I’ve got a lot of leeway. Whereas with my e-commerce store, there’s not a lot of margin there and I have to do a lot better job of managing my ads. So I want to focus today obviously on how to run Facebook ads, specifically physical products, especially ones that carry kind of lower margins. First of all, would you say that there’s a certain average order size that you need to have in order to just make Facebook ads work in general? Andrew: I mean, it’s very difficult in 2018 Facebook and Instagram advertising, we’ll talk about them together. It’s hard to make a product that is sort of that sub $50 category work well at scale. Not saying it can’t happen. You look at somebody like Pura Vida Bracelets or Blenders Eyewear right there, AOVs are lower. And it’s because our product has a much bigger mass market appeal. You know, bracelets, everybody likes that, sunglasses; everybody is going to need a pair of shades. So in those cases, it can work. But I think if you’re looking in that $50 category, it’s going to be difficult. Now, I’ve seen people that have had a [inaudible 00:05:57] an average order value of 25, and they need to get people to purchase. What you have to do is basically start to look at bringing people in for emails, which is going to be a much more reasonable expectation to bring people in, and overtime convince them. So it’s not that it can’t work. It’s just that the model of taking them from buying or from never knowing of you to buying in a short period of time and only spending, let’s say, your CPA margin and the $25 AOV is $15 or 10, right? It’s good. You have to really condense that and make that shorter. So that’s what I would say. Steve: And would you say that all products are good for Facebook ads? Like does your product need to solve a specific problem in order for Facebook ads to work well? Andrew: Not necessarily. I think that if your pitch is a good one and the way that you’re coming at it is interesting and his novel and is something that people would be interested and potentially aware of, then I think you can be okay. There’s 100,000 different watch companies online, right? Let’s just take that example of that market. Okay, so you look at, there’s everything from movement who those guys have seen great success, right. And then there’s if you sort of go up from there, there’s a brand called Linjer [ph], they are much even more expensive, then there’s things all the way down to Flex Watches. And this is an interesting company. I don’t know if you’ve ever heard of them. My friend David Herman at Social Outlier, he’s the one that runs a lot of the Flex stuff. And it’s interesting because for them, it’s a pitch that you can make, because they’re saying, look, here’s what we do, these watches are tied to causes. So it’s something that people immediately are attached to, versus something where it’s not just a watch, there’s a more meaning to that. So I think if you have something like that, where it’s a story, you look at a company like Rareform, they take old billboards and turn them into bags. That’s an interesting story, right? There’s a lot of other bag companies, but what’s the genesis of it? What are you doing either before, how is the product created? Is there a story there? And then at the end, is there something that, or is there something happens after, so you buy a product, and then something gets donated because of that. Steve: Okay, I mean, just basically make sure you have a strong value proposition before you start running ads, essentially. Andrew: Yeah, and I would say not just one, so like making sure that there’s multiple. There was a company I worked with that was a wind purifier, handheld wind purifier. Well, okay, that is a great product but how do you pitch that? How do you talk about that? What are the multiple ways that you can pitch that because the first one that you think is the greatest part about it is probably not going to be the one that the audience responds to. So making sure that you have multiple ways that you’re willing to talk about it, and setting the expectation too of saying, okay, I’m willing to try this for six months of trying different pitches, and hooks and value props. Steve: So let’s pick one of those examples that you just said and just kind of run through a complete example of how you would use Facebook ads to kind of build up an audience and sell that imaginary physical product. So where do you begin? Andrew: So I think the first place that you would start in looking at what you’re trying to sell is, number one, what can I do in terms of the creative pitch that I am making with multiple types of content? So the first one is, what can I do with visuals in terms of photos that are going to make this product something that’s going to stand out? The first one is, let’s think about static imagery. So what are ways that you can set this product against a background that is going to cause it to have high contrast? So that’s the first question. The second question is, what can I do in these images to add movement? So maybe I’m setting it against a high contrast background or something, it’s going to cause it to stand out. And then what can I do in the product, in the imagery that is turning it into a gift or even a video file that’s going to add movement to that, that’s going to cause people to stop in their Instagram or Facebook newsfeed and look at that? Steve: Would you say that video is pretty much the standard now when you run Facebook ads, at least top of funnel ads? Andrew: Actually video for a long time for top of funnel and direct response for products actually has never really been something that’s worked. It’s something that people because of the info market talk about a lot for being a video prospecting tool. And we can talk about that. But in many cases, video actually doesn’t work that well for driving physical sales. Now, there’s many exceptions to this rule, right? So there’s a lot of places where people have said, hey, I’ve used this video for a long time, it describes what we do, and people love it, then fantastic. But in a lot of cases, if you said to me, hey, I want to get up and get profitable and I want to get running on Facebook using the methods that you have Andrew in the first 30 days, I would not suggest video. Andrew: Video is something that is really middle to lower funnel because you’re trying to further a brand proposition. But I think in-house, it is a thing to experiment with. So adding that movement, as we talked about is an interesting one that you can do. And the third one I would try too is trying video. Maybe for your brand, it’s something that works, maybe it’s something that the story there does work, and you’re not necessarily looking for a return on that particular creative right away. But you’re using that as a way under video view audiences. So people watch 10 seconds of a video or 30 seconds of a video and that’s a way that you’re remarketing to people. So under like what’s called engagement, customer audiences, which many of you may be familiar with. So those are the first things that I would set up as a test and kind of looking at this surveying the creative landscape. Now, a lot of times the second and third options for e-commerce business owners that are like Andrew, that’s great. I’m glad to do that. But I have like this video that we created about my brand story. We don’t have the money to create another brand video now. And so what do you suggest that we do? I think, going back to what Rick said, right on previous episode for you is talking about, Rick Mulready was talking about what can we do using iPhone. What can you do that’s going to be sort of something that looks more native, that generally does work better? But in a lot of cases, I think those are the tests that I would run. Now, if you were to go more specific on prospecting and saying, okay, setting up day one, what are we doing? The first things I would ask for are at least three to five 1,000 by 1,000 images. All right, so basically square images that we can use in photo posts or that we can use in carousel ads. And then the second one would be a collection of three to five, 1,200 hundred by 628 link post images. So those two drivers are the most common — or those two ad units, excuse me, are the most common drivers for prospecting traffic to a website? And those are the ones that are the most proven in overtime that really get people to a site. Steve: So for your top of funnel ads, do you always offer — give some sort of offer to entice people to click on it for the top of funnel? Andrew: If you can, it’s always a good idea. So what are the things that you can offer? Is it is it 15% off, is it 10% off? I think that is something that is going to get people to check it out if it’s coupled with a creative that they find visually interesting and appealing. And that deal obviously, can become more sweet as you go down the funnel. Some people don’t want to do that. So I have a client of mine that is they sell mostly handmade, all organic baby clothing, okay, so kind of a very specific niche thing. And for them, what they do on the top of the funnel is they actually just talk about and use language about slowing down and making sure that you’re caring for your child, there’s no discount offer on the front end of it at all. Because what we’re trying to do is find that very specific type of person that’s going to connect with the messaging first to go and say, oh, that’s interesting. What is this? Right, it looks more of something that you’d see like from a friend, that they would share or something, right. It feels more native in that way. So I think that’s kind of — there’s different routes. If I were to set it up say Andrew, what’s the successful route, it would be trying a 15% off offer on the top of funnel if you can, even if it doesn’t get redeemed as much to try to bring people in, you give them an incentive. Steve: Would it be better to send a coupon to a product page or would you suggest sending them to some sort of landing page where you can really describe your unique value proposition or both? Andrew: I’ve done both. And it depends, again, on what the product is, right? If something requires more explanation, then sending them to a place where there’s more explanation that’s going to have more context is going to be a great idea. I think the first one, though, I mean, in most cases, if you’re saying, okay, this is a watch or a pair of sunglasses, that doesn’t need a lot of explanation. So for me, then it’s driving them to a best seller’s page in most cases, where how quickly can we get someone to this site that’s going to check out what we’ve got, and start to browse the products from there. Steve: Okay. And in a previous podcast that I heard you on, you mentioned producing your ad with social proof, possibly by running ads to cheaper countries before putting the ad out to the US, or wherever you happen to be. Is that still something that you do? Andrew: Yes, and so this is a strategy. Yeah, it’s called social proofing that people use in the industry and it’s an interesting one, specifically in relation to photo post. So if you have a product that you’re trying to basically get people to — you’re trying to take over a large percentage of the mobile news feed, a photo post, which is that 1,000 by 1,000 imagery with a copy in the description and then a Bitly link at the and or a shortened link at the end is going to be a productive one for you. That social proofing and some people do it to other countries. It’s something that I’ve tested, but you get a lot of low quality on it. What happens now with social proofing in this concept is you basically take an ad, you run it for page post engagement to a selection of the audiences. This is the way that I do it in the United States, a very wide audience. So if my core market is 20 to 40 year old women, I’m going to run it to 20 to 40 year old women, exclude my fans, and all my website visitors and basically anybody that’s ever been in touch with me, and I’m going to run it with no other targeting. Sometimes you can layer in, okay, if it’s a mom product, I’ll layer a mom demographic or something. But your idea is to basically build social proof and let Facebook find people that are likely to engage under that objective with that particular ad. And what happens is that helps to increase relevance score. So the zero to 10 score of quality that Facebook gives you on the ad level, and it says, okay, this is an ad that’s engaging, you can then take that post ID, and you use it within a conversion campaign. And really what it does more than anything, Steve, is it really takes your copy, it takes that ad, and it turns it into a place where people are looking for validation. If you think about the times you’ve looked at Facebook or Instagram ads in the last six months, many of us look at the comments, right? You’re like, I’m interested, like it’s kind of an interesting product, and you’ll click and look at the comments. So it’s something that it helps to turn your ad into its own landing page. That’s really the power in my opinion of the social proofing. Because if you start to use that ad, and then you get people that have bought, that have seen it, that are commenting on it, saying, hey, I checked, I got mine, I’ll let you know, that’s really where the power of this starts to come in with social proofing. Because it validates the product before the person even gets to your landing page in many cases, which is a good thing. Steve: So how long do you run this social proofing ad before you start writing the real ad? Andrew: It’s generally around 48 to 72 hours that we’ll run it depending on how much social proof we’re getting. So in many cases, if you’re running, what I’m looking for initially, is I’m just looking for all right, what can I do to just get some likes and shares on this, just some social engagement that’s going to give it a little bit of a leg up. That’s really the first thing that I’ll do, and then we’ll kind of switch it over. And then sometimes what you can do too is, okay, let’s say an ad, or let’s say, one or two ads are doing well on that prospecting traffic is you can take that same ad that’s running and doing well. And you can launch that to middle of the funnel, for example. So let’s say if an ad is doing well, they can keep seeing it. So let’s say they’ve engaged with a post in your 14 day engage your audience, they’ve engaged with it previously on Facebook, you launch it to them again, and maybe it’s even a different one. And you’re continuing to build social proof on it from people that are a little bit farther down the funnel. So you’re looking to kind of use those posts as, again, a validation that you have. And all of this will of course, be in combination with using dynamic product ads and remarketing. Steve: Sure, we’ll make it down to the bottom of the funnel. So with those engagement ads, what are some guidelines on whether it’s working well, or not? Like how do you determine whether it’s working well? Andrew: I mean, for me, in terms of the engagement, I’m just looking in terms of is it getting engagement, and is the click through rate like north of 2%, like are there people that are looking at it, clicking through on it, and is the relevant score like north of eight as well? So seven or eight, that’s looking pretty good, right? People find this kind of interesting, that’s a good thing. So that’s kind of the quality that I’d be looking for. And then, of course, once we pull it in, and giving it that 48 to 72 hours of testing on a conversion campaign, is this something that people are going to click on and buy? So I’ve had plenty of times where I’ve had a social proved post that’s gone into Facebook in a conversion campaign and I’m running it and it’ll have a really high relevance score, but it won’t convert. So it’s getting a lot of great traffic, but it’s not necessarily converting, and then you can make that determination, right? If I’m okay because my ROI is so great on remarketing, if I’m okay, recovering my costs on my prospecting traffic, then absolutely, that’s a bet that you can make. Steve: I just want to take a moment to thank PickFu for being a sponsor of the show. If you currently sell on Amazon like I do, then you know how crucial the quality of your Amazon listing is to the success of your e-commerce business. So for example, I’ve run experiments on my Amazon listings, we’re simply replacing the main image with a different photo resulted in a 2X increase in conversions. But how do you choose the best and highest converting photos for your listings? How do you know that you’re using the most profitable images for your products? And how do you know that your bullet points are convincing? This is where PickFu comes in. PickFu allows you to solicit real human feedback about your Amazon listings in 10 minutes or less. And you can target the exact demographic of your end customer. So for example, let’s say you sell napkins and you two have main product images that you want to test, you would simply go to PickFu list the images, target female Amazon Prime members over the age of 35 and hit go. Within 10 minutes, you’ll get feedback of which image people are more likely to buy along with specific feedback on why they made their decision. In fact, I’ve used PickFu to almost double the conversion rate on several of my Amazon listings by testing my images, bullet points, and product titles. And what I like about PickFu is that you get results quickly unlike traditional split testing, and you can use this to test book covers, landing pages, basically anything. Not only that, but it’s super cheap to run a poll. And right now you can get 50% off your first poll by going to PickFu.com/Steve. Once again that’s P-I-C-K-F-U.com/Steve. Now back to the show. Okay. And then how do you pick an audience for that top of funnel? I heard in a separate interview that people are just targeting huge audiences now, huge, broad audiences. And some people are even just not even targeting at all, like targeting the entire country. What’s the rationale for that? Andrew: Yeah, so I think this is an interesting shift that we’ve definitely seen in the last, let’s say, three to four months, which is Facebook gives us so many options on targeting, right. I mean, it’s just enormous the amount of things that you can do. And in many cases, what we do is Facebook advertisers, the traditional method was that we were going to use that targeting to our advantage and we’re going to make it as specific as possible. What’s happened with the maturity of the Facebook ad auction and the algorithm itself is that the amount of data that they have within that is now so good and so rich, that basically launching advertisement to that grouping is something that to any grouping is they’re going to know that those are the people they’re likely to convert. So launching it to a wide audience is basically you saying to Facebook, hey Facebook, you know better than I do, find me people that are likely to convert, and especially if you have what I call a seasoned pixel. So if you’ve spent north of 10 to 20,000 dollars through Facebook ads, Facebook understands what the difference is between somebody that, let’s say, adds to cart, use content or converts. So they’re going to be able to properly understand, okay, we’re going to women 18 to 40 in the United States, we want to find people who are likely to convert, they look like these people, which is thus making that pool larger and the converting is helpful. So prospecting traffic can be set up in a whole number of ways. And what you’re trying to do, I mean, generally, what you’re looking at for successes is you’re looking at using lookalike audiences in many cases of not just purchasers, but looking at your lifetime value purchasers, your best lifetime value purchasers, you’re looking at people that have taken multiple actions. So for you, if you’ve seen that, let’s say, the engage your audience, as we talked about before, is a valuable one to you, I have a client that basically when people engage with them on Instagram, that is a fairly good signal that they’re probably going to buy. So creating a lookalike audience of those people that have engaged with them for 1% is a really helpful thing. So I think, traditionally, if you were to look right now at a huge account, or even a mild sized, midsized Facebook ads account, let’s say spending in that 20 to $50,000 a month range, and then you look at those that are spending 200k a month plus, you’ll see a pattern in prospecting of generally a 1% look alike of those top AOV customers, and then generally some other 1% look alike that is kind of built from some other set of audience. So that engage your audience is one maybe it’s a two time page views last 60 days, something like that, let’s say the add to cart is a strong signal for you. So something like that. And sometimes these are separated, sometimes they’re grouped together. Then you look and see a three to 5% lookalike range, sometimes people will have there for scale, and then they’ll have a wide audience. So they’ll have a wide audience that they’re running, generally no targeting. That’s very common now letting Facebook decide. And then you’ll have many times a broad match dynamic product ad, which is another one, which is a prospecting traffic that’s under product catalog sales. But it lets Facebook again decide based on what they know previously about those that have interacted with your product catalog and shows it to them, shows them dynamic creative on basically, okay, these are the products that have sold well to these types of people before. So those are kind of the components, I would say that you’ll see commonly with the prospecting traffic in a lot of those accounts. Steve: So if you don’t have a season pixel, though, you wouldn’t recommend going broad with no targeting, I would imagine, right? Andrew: No exactly. So if you don’t have it, if you don’t have a season pixel, let’s say you’re getting into — I work a lot with companies that are spending in that 5000 a month, 10,000 a month, they’re kind of getting going. And what you’ve got to have then is, you’ve got to have generally look alikes as well. Of course, you’ve got to have — if you have had a lot of people come through purchaser funnel, then you can do a look like of that, maybe an email look alike, maybe you’re grouping those together. And then you got to have a section of interest based look alikes that usually are built off of audience insights in a lot of cases. So, you’re building off of really not like really big interest, but more specific interests on other brands. And then you have another one usually of behaviors. So it’ll be based on credit card behavior, of people that look like X or buy X, or donate to this type of nonprofit or whatever, right. So I think you want to try experimenting with as much as you possibly can. And where you find scale in some of those as well as you’re growing is, instead of grouping the interest targets together, you can separate them out and make sure that, okay, look, fans of Tim Ferriss are more likely to buy this product than people that follow Amy Porterfield or whatever the example is. So instead of grouping them, you can find scale by testing those things on interest, because you just don’t have enough data yet, which is totally fine, right? I mean, you have to basically you have all this other targeting is available to you with the ultimate goal of bringing it into something that is that proprietary lookalike audience that only you have the data available to use. Steve: So what are your goals with your top of funnel campaigns? Andrew: So my goal and a lot of people I’ve had discussions I would say about this with people and for many e-commerce business owners, it’s hard to do. But for me in the first what I’m looking for in prospecting is can I basically break even in the first 30 days, okay? So can I recover my costs, because you have to think about what you’re trying to do, right? You’re trying to take people from never hearing of you to buying within a 30 day period, which in some case is easier than others. But in other cases, if you don’t have a product that sets itself apart necessarily, then that’s something to be aware of that is going to take maybe a little bit longer. So I was talking to a client of mine, they sell t-shirts that are awesome t-shirts, they are very witty, and they have a lot of funny things on them and people really love them. And for them the way that they worked in their cogs, they needed to make at least one and a half ROS over a 30 day period. Okay, fine, then that’s the metric, right? That’s what you want to build. But that’s generally what I’m looking for. Because then what that means is I’m not only recovering my costs in the prospecting, but my remarketing then has to be productive at a 3X or whatever. I’m able to look at a combined ROS of let’s say, two and a half or two. I mean, it depends on where your metrics are. But generally speaking, that’s what I’m looking for to say, okay, that is successful for me. And a lot of other people would say, and then they have said to me, Andrew, I think that’s ridiculous. Like, it should be much more productive than that. And, okay, right. If you have a higher AOV product, that’s going to be easier. Let’s say you spend $200, but your AOV is $200, you get one sale, you’re in much better shape. So that’s kind of the way that I think about it from a prospecting standpoint. Steve: What’s your experience been with the broad match dynamic ads? I’m running them right now and I’m getting like a two to one ROS, but I’m just letting Facebook do all the work. Is that something that you’ve been doing a lot with your customers? Andrew: Absolutely, broad match ads are fantastic. They’re a great tool for free to use. And again, letting Facebook decide. They generally what you have to do though, is be really patient with broad match ads. It’s very common that they will take 30 to 45 days to see a return. So you have to just sort of let it be. There was a person that came to the intensive that Austin I did in Austin and he launched it when he heard about me talking about this on another podcast in January, or excuse me in December. And he came in January, and he had let it run for 30 days. And he said, the first two weeks it was crap, nothing happened. He said it was like three sales. And he said, then by the time he came in late January, excuse me, early February, that it was like two and a half, 3X. So you have to be — it takes into consideration a lot of latency. So you have to be just sort of cautious of that. But that’s generally, that’s a great tool for prospecting. And I think ultimately, what Facebook is trying to do here is trying to give us options to have us not overcomplicate things as well. Right? So lookalike audiences are always going to be something you’re layering and then the way that you’re using middle to lower funnel stuff is always going to be a little bit more complicated of a way that you’re going about it. But generally speaking, that broad match and the wider audiences are both fantastic ideas to try. Steve: So speaking of letting it run, how long do you let ads run before you make any determination? Andrew: Yeah, I mean, I completely agree with sort of other industry knowledge in this. I generally look at a 48 to 72 hour period, I mean, before I’m saying, okay, that’s interesting, that’s not going to do anything for me. If I’ll see that, let’s say the cost per click is incredibly low on something, and the relevant score is high, I may let that run longer, even if it hasn’t had a sale just because I’m curious of the reaction that would come off of that. But that’s generally the rule that I have. Steve: Okay, and then what conversion objective do you choose the Add To Cart purchase? Andrew: It depends on the product itself. So in many — if let’s say you’re looking at a product that has a higher average order value that would be let’s say, north of $100, you’re going to see more success doing generally something like an Add To Cart instead of a purchase. And that’s because getting people to purchase and the amount of people that are going to purchase $100 product on something immediately is smaller than those that are probably going to add to cart or even page view. What you’re trying to do is get as close as you can to those that 50 conversions a week under the initial learning phase that Facebook has at the ad set level. And so you have to think about, okay, look, if I get one purchase over a seven day period, or two, or three on a prospecting audience, that’s not giving Facebook the strongest signals. And so it’s really about the signals you’re giving to them. And you want to, if you can stabilize, and let’s say change that pixel optimization to add to cart, which is going to be bring that into a more stable period, and it’s going to get you closer to 50, which would hopefully then sort of stabilize that performance on that ad set if it’s doing well. Steve: Okay. And what does your middle of the funnel look like? Andrew: Middle of the funnel is really interesting. It looks very different for a lot of different people. In many cases, what I’m trying to do in middle of the funnel is taking, I’m trying to talk to people using page post engagement objective, using sometimes a lead ad objective for email signup, using even conversion campaigns, website click campaigns. I’m using a lot of different stuff to launch to people that are in that middle of the funnel of engage your audience. They have watched a video, they’ve done something, they’re generally many times in a fan base. That’s something I consider middle of the funnel to some degree, let’s say fan, but hasn’t been back to the website in a certain period of time, or 180 day visit, or minus 30 day period. So what I’m trying to do is within Facebook, everybody has it sits within a different objective pool. So let’s say there’s people that are really big engagers, they engage with stuff. Let’s say, there’s people that watch videos, there’s people that click to the website, there’s people that convert. So I’m trying to basically find out where my audience responds and what they will do. I have a middle of the funnel ad running now that I update every two days for one of my clients. And that middle of funnel ad is their Instagram content, basically, that I just repurpose as an ad every two days to people that are in a 21 day top 25% website custom audience. So they’ve been to the website, they’ve spent time there, but they haven’t purchased or added to cart. So I’m trying to launch a page post. I launch a page post engagement at them to get them to comment, to get them to consider because that’s going to hit a larger segment of that audience generally speaking. Steve: What does that look like? Is there an offer associated with it? Andrew: No, it’s just a branding piece, pretty much. I mean, it talks about things that are back in stock, but it’s not generally getting any sort of discount. And people will do that in different places. Sometimes people will say, okay, look in that middle of funnel, I do want to put a discount in it, I want it to be a pretty decent one, because I really want to try to bring them back. And that’s something that has worked, then great. If you see that in your email flow, let’s say you have Klaviyo setup and you see that a BOGO offered as well to a 14 day or 30 day audience or something, then try that in Facebook, I’ll bring them back in. Sometimes it really depends on what the person is trying to do of driving them back in. Sometimes by not pitching, you can be better off by not discounting heavier. And that’s something that I’ve had to really swallow as a marketer to try some of the branded content that they have just to see, and to try to build that story, especially if it’s a higher average order value product. Now, if it’s a $40 product or something, then I think discounting in the middle of the funnel is a completely reasonable thing to do. But if you’re trying to really tell a story and turn them into eventually a purchaser and then an advocate, I think branding in the middle of funnel can be something that can be helpful for driving them back in. Steve: So it sounds like your middle of the funnel isn’t really designed to be profitable? Andrew: No, it actually many times it usually is. I mean, many times, it’s at least a one and a half to two X in a lot of cases because again, depends. But that’s really something that I’ve seen work because I’m hitting people with all different objectives. Sometimes a video ad won’t work, let’s say a brand story in the middle of funnel, they’ve come, they’re brand new visitor, they’re not on the email list or something. And let’s say the video ad I’m spending $5 a day on but it’s going to some of my best audiences, that may get one sale a week, but that one sale is enough to cover two weeks of spending on it. So it is definitely intended to recover costs. But it’s also intended to tell that larger part of the story. And that’s something again; I’ve had to adjust my methods on. My old method was this simplistic sort of 1% lookalike offer on the top link post ad or photo post ad, driving them in and then just having a dynamic product ad over a 60 day period, that something they viewed or added to cart. I think more than anything, what I’m trying to do now is help people and help clients understand that that model is okay and it can work, but it’s not something that’s going to be sustainable. So how do you build out sort of some more content, that storytelling that feels more organic that’s going to help them over time be like okay, I really like these people instead of just saying like, oh, let’s get to the discount immediately. And it requires more patience frankly, which is tougher because it’s sometimes can take a little bit longer to prove but generally is more sustainable. Steve: And then your bottom of the funnel is just DPA? Andrew: Yeah, so bottom of the funnel is usually a mixture of dynamic product ads within certain window. So many times I’ll have a 90 day, a 30 day, a seven day, and a one day. People do this very differently. There’s different levels of offers within those dynamic product ads. Let’s say sometimes it’s a collections add in a 30 day and it’s a singular image within a one day because they probably looked at a specific product, and it’s a carousel on a seven day something like that. And then always doing a 30 day remarketing if you can just website custom audience launching new creative at them to make sure the frequencies aren’t above three and kind of freshening those up and running those as complementary to one another. In many cases we’ll also have some sort of a Yotpo or review DPA running which does well as another level of validation. And then of course in the really bottom is loyalty. So building, sending new product ads to custom previous customers is something that I really love to do because it kind of helps to them say, oh, that’s really neat or giving them some sort of special offer, something to those previous purchasers. That loyalty audience is one that I would say in nine out of 10 consulting sessions that I’ll do I don’t see setup because it doesn’t — you’re like I don’t want to bother. But you can set it up to be very careful around how your messaging. Steve: These are people that is not for me already, but you want to buy them but they haven’t purchased in a while, right? Andrew: Yeah, they haven’t purchased in a while, right? So you’re excluding let’s say the last 30 day on that and you’re wanting to just tell them about what’s going on, right? You want them to become an advocate. I think it’s akin to what you talked about in your previous episodes even of calling people and saying how is the going, right? I have one client that launches previous purchase, actually its previous leads in this case. They have a messenger ad campaign going and it doesn’t even go into ManyChat flow or anything and actually just drives them in, it’s day parted so it’s only live from nine to three their local time. And it’s a day parted ad that runs to previous purchasers asking them how is the going? Like, what can we do for you, is there anything that you would like to chat about? Steve: They have someone physically man the chat, you mean? Andrew: Yeah, they have somebody physically manning the chat. So again, I don’t think a lot of people are going to do that. But it’s akin to what you’re talking about, right, of getting feedback from people and turning them into advocates. I mean, we had a situation with a major client of ours a year ago. They launched a similar ad campaign in Messenger asking people about which products they should launch. And it was a survey that they took actually again, not in ManyChat or anything which we certainly could do now really easily. But it asked them what they thought, and they got 5,000 people that gave them their thoughts on new products. I mean, it was just ridiculous. So, that’s one of those things where I think loyalty — we have to remember that these are people, right? You have to remember that if you get 1,000 impressions that’s 1,000 people you’re showing it to, and so take care of the those customers. And generally, that can be a really nice long tail effort that’s going to help to really build things and build a nice organic base too for your people that are coming back. Bottom line, the concept is very simple. We all help each other promote each other’s businesses, get free promotion from bloggers, and share the spoils, which in this case, are the email addresses. If you are interested in growing your email list, then head on over to GoBrandWin.com. That’s G-O-B-R-A-N-D-W-I-N.com. It’s 100% free, so sign up now. Now back to the show. It’s just hard to measure that though, you know what I mean? For me, personally, I like to see the sale obviously. So it’s hard for me to take into account the loyalty factor in the numbers. Andrew: Yeah, and loyalty factor generally for us, we’re always tracking it with the pixel. So that ad set, I mean, if you’re launching product release ads or something, we’re always — I very regularly will see a two or 3X on that very commonly. There’s one company that I’m privy to, just looked at their ad account last week, they spent a quarter of a million almost over seven days. And one of the things that they have running is they have the exact same ads that are running to prospecting that they have running to the loyalty audience that are new styles. And what has ended up happening is people are taking screenshot, or taking photos of themselves and putting them in the comments because they asked for it in the ad. If you bought this product before, check it out. And it’s absurd. It’s like it goes back to the idea of turning that into that landing page. So that’s where I think experimenting on that is something that could be powerful. You could have it be super laborious, it has a ton of steps where you have to sit there, and man the chat, or you can just try it saying, hey, by the way, we’ve got these new products, check it out. And you could launch that using daily unique reach base that they only see it once a day and just see what happens, right? Steve: What does your 30 day dynamic product ads look like 30 and 60, and 90 day? Andrew: That again, totally depends. In many cases, I like to use collections ads in those because in a 90 day period, it’s like you’re trying to get them to a catalog, right? So you’re trying to like get them to sort of like, browse again. And so that’s what we’re looking for. In the 30 day generally speaking, it’s I would say a split between kind of the carousel and the collections ad, it depends. Many times it’ll be a carousel, though, in that case. Steve: Do you offer discounts at that point? Andrew: Yeah, yeah, definitely. So that’s where most of the discounting is coming in, is hey, here’s the deal, right? Come in, and check this out. Here’s a discount, 20% off. Usually, it’s more, I mean; you have to think about how good of an offer is this? It’s like, sometimes people say, well, I want to do 10% on the low funnel. Okay, that’s fine. But like, would that make you buy? It’s like, you have to – and they’ll say, well, I don’t have the margins for it. Okay, then maybe we should talk about building that into the margins, because just the sheer fact that your products are cool is great. But it’s not going to probably be something that’s incredibly scalable over time. Steve: Right okay. And then how do you work in Messenger ads into all this? Like for your top of funnel do you try to get a Messenger subscriber or do you ever run Messenger ads? Andrew: Yeah, Messenger ads live in an interesting place. And mostly where we’re using Messenger ads in this case is for doing things that are more B2B. So, asking them, hey, are you — taking let’s say, a 30 day remarket or a 30 day top 25% website custom audience and launching Messenger ads at them and saying, are you interested in talking more about this? If so, comment, get started, right? And comment, let’s talk or whatever. And then you’re bringing them into a flow or you’re qualifying them and asking them questions, and then adding them to different kind of broadcast pools from there. So that’s really where I’ve been using it more often. We haven’t used the messenger flows as much in e-commerce. The people that — I sort of, I wait a while on new stuff to be honest with you to see what other people are doing and to prove it out. I think where I’ve seen the best success with it is using it in a contest thing format. So if you have a customer or potential customer that is somebody that would be interested in a contest, then using Messenger ads can be a really interesting way, comment here to enter in this contest, and that’s one way to do it. But I’ve used it in B2B mostly. And then I’ve used it in loyalty ecom for asking questions and things like that. But we haven’t used it as much in the driving sales. Steve: She’s coming on next week, actually. Andrew: Yeah, she’s amazing, right. She’s sort of the woman of note in the Messenger ad industry. And I think she has a lot of interesting ideas in terms of — and better that have worked, how you bring leads in, right. So in the lead cost, there is really low open rates are incredibly high. And there is ways that you can use it in Ecom, but I think they are less common right now. The thing that I worry about with Messenger ads to be honest with you and I’ll probably take heat for this, but I worry that they turn into what video ads have become to some degree in the industry where they talk about it and there’s sort of this whole body of discussion in the industry about how video ads are everything, you got to do them all the time. And they don’t work in direct response product Ecom as well. They may work in lead generation, but then I’ll look at something like there’s a CrossFit brand that I know and work with, and they launched a deep discount on a particular product that they had. And it brought them into saying, hey, are you interested in this product, it’s normally $40, it’s $10, click here to subscribe and buy this product. And that they’re seeing a two and a half return on ad spend on that on prospecting right now. And they’re also getting people subscribing into their daily inspirational message flow. So that’s where I think that’s an interesting way that it can be used, but in the times that we have tested it at scale, it’s not something that’s been 100% part of the recipe yet. So I think there’s more to note about that. And hopefully Molly can give some good inspiration as well next week. Steve: Why would you say that? Why do you think that video ads don’t work as well as the image ads for the prospecting phase? Andrew: I think it’s because a lot of people, I mean, you’re just not going to get people to watch a certain percentage of the ad to make it worth it on video, right. I think video generally speaking, think about how quickly you go, I mean, you go through newsfeed. Like for me, if I’m looking at for 30 seconds like I might look at like 30 posts, like, you’re going through it very quickly. If it’s a company I don’t know, then I think it’s much more difficult. Now, there’s exceptions to this. Let’s say takes like a Brooklyn or something, where they’re doing animated GIF and or like a boomerang video. Okay, well, that’s an interesting way to take over the newsfeed, to add movement, and to then have a video ad that is building that video view audience. So I think that there are opportunities with higher AOV products that it can work in that regard. But for many cases, it just doesn’t drive the traffic. That’s really where I mean, I have tested this so many times. And you can look at that — I can show examples. I mean, I could take screenshots of things where video has been tried in accounts of major scale and it just doesn’t work as well. But video can, I looked at an account yesterday, they had Instagram story ad running, they’ve four Instagram story ads running that I thought were awesome. They looked really good. And all of their prospecting over a 14 day period on the Instagram story ads, CPAs were through the roof, it wasn’t working. But in the add to cart, that was working well, right. So the farther people go down, they are, like oh, yeah, that’s awesome. I was going to buy that anyway. So I think that’s where it can become powerful. But it just doesn’t generally drive the traffic. And this is a big difference between the info market in this because in info market, it’s something that you get people to watch part of it, it’s inspirational video, and you’re like, oh, yeah, that’s awesome. I definitely want to be a part of that moving forward. So that’s generally why I it’s harder. I’m not saying it doesn’t work. But I believe that there are more challenges that will present themselves. So just be careful where you use it and prospecting is generally my rule. Steve: Interesting. Yeah, I mean, it just seems like video offers more options for retargeting because you can target based on how much they’ve watched, like, more options than if you just did a regular link ad. Andrew: Yeah. And again, great point. It does, there are options that are there and it does give you a lot of flexibility. It’s just that for those of you that are thinking about trying it, or have tried it, it’s something just to be aware of, it may work for you. This is something that I have — I look at literally probably at least 30 accounts a week. And so this is something that I have just seen more often than not, it’s something I wanted to throw out there to be careful of. Steve: Cool. Well, Andrew, believe it or not, we’ve been chatting for almost 45 minutes now. And I want to be respectful of your time. Where can people find you if they want to learn more about what you do or what you’re working on with Austin and that sort of thing? Andrew: Yeah, definitely. So you can check out the Ecommerce Influence Podcast, which is one place and then you can check out our Foxwelldigital.com, which is the business that my wife and I run together with our fluffy golden doodle dog. Steve: Typically what type of clients do you take on at Foxwell Digital? Andrew: Well, we’re doing a lot of different things. Sometimes we play matchmaker between companies that are looking for an agency and agencies. So that’s a little bit of work that we do, we also do coaching for people. So we’ll come in and look at things and we’ll do everything from we come to your company, and we sit there for a day with you going over things and actually fly out to we’ll do coaching over a certain period of time over zoom and things of that nature. We do take on some management but it’s very, very specific mostly because we purposefully are a very small shop. So we don’t take on a lot of management at this point because the people we have are good and we want to really grow in the coaching area versus the management side because that’s just what we do. So yeah, so that’s where you can check it out. But that’s generally what it looks like. But if you’re interested in chatting, send me a note. I’d love to chat with you. And if you have different experiences or you disagree or agree with what I’m saying, I’m always interested to hear because the thing I love about this industry is honestly I’m always learning every day. I get proven wrong and sometimes I’ll get proven right, and so I feel like it’s never ending. And for me that’s always really interesting because there’s always something that you can be trying. Steve: Well Andrew, thanks a lot for coming on the show. Really appreciate your time. Hope you enjoyed that episode. What I find interesting about listening to Facebook experts is that everyone has different experiences and strategies which just goes to show that you have to take it all in, experiment yourself and figure out what works best for you. For more information about this episode, go to mywifequitherjob.com/episode214.